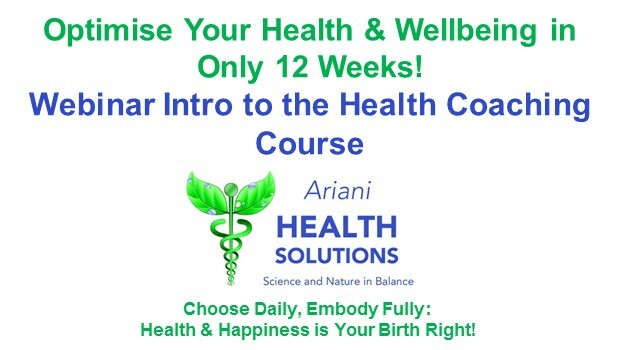 Optimise Your Health & Wellbeing in Only 12 Weeks! A step-by-step practical approach to a healthier you. Take charge of your health now. All in the comfort of your home, in your own time! I invite you to join me on a journey to exuberant health and happiness. There are many fine things that money can buy but your health is a precious commodity without which everything else is inconsequential. Investing in your health is the most valuable step you can take for yourself, your family and your business. Do not allow dis-ease to ruin your life. Take charge and resume control over your own wellbeing. Do not allow dis-ease to creep up on you! Take action now to become and remain, abundantly healthy. Reclaim your God-given right to be optimally healthy by learning how to do it. Your body is such an amazing piece of intricate and finely tuned equipment. Confidently step into the role of guardian and custodian of your own wellbeing and take your power back from dis-ease, that might start as a mere twitch of unease! The very first problem is that we expect to deteriorate as we age. Somehow, this resolve to feel horrible as we age, is programmed into us. We accept the aches and pains almost as a right of passage. I honestly think we should stop this immediately! Good health when you’re young, and continued good health as you age is your birthright. This course will teach you how to do so. Enrol now! I am Arien, author and medical doctor specialising in natural, integrative medicine. Together with my daughter and business partner, Anri, we create practical mind-body-soul health coaching courses. We are now ready to go global to share the good news with others: our natural state as human beings is one of 'health and happiness‘! Very often, even after years of being a medical doctor, I still find myself marvelling at the amazingly powerful and finely tuned orchestra we call our bodies. We don’t give our vibrantly beating hearts a second thought, don’t even notice our brains and kidneys functioning and never stop to think how our lungs work tirelessly to keep us alive. We don’t fully appreciate how our eyes, ears and noses open up the understanding of the world around us. We each have personal and unlimited access to a super-computer-driven piece of ‘technology’, with a mind that extends even further than the brain and heart! I have come to realise that I was placed here on earth now, with the sole purpose of educating and informing (everyone willing to listen!) about the many ways we can learn to appreciate and care for this wonderful piece of equipment we were all given. I want to take you on a journey to awaken you to the necessity of taking self-responsibility for your own health and wellbeing, while providing you with the tools and techniques to do so. It is easier than you think. And I will guide you with information, tips and tricks to take care of yourself to look younger, activate your dormant DNA from soul to cell, feel better and more alive than you ever thought possible. I am super excited to start our online journey to educate, support and teach people the necessary tools for optimal health and wellbeing! The human body has always fascinated me and my passion in life is to help others love, appreciate and take care of their bodies, both physically and mentally. I am in love with all things wellness related. My dream of helping others came true in 2013 when I started my own company, PlayFunFitness. I deal with many people who are completely dissatisfied with their bodies, filled with self-loathing. Living a healthy lifestyle has never been a big challenge for me, but I know it is for most people. I have never enjoyed boring repetitive gym programs, or obsessing over calories. I developed a program that combines fun with effective exercises - automatically leading to results. I try my best every day to motivate, facilitate, educate and support people on their journey into optimal health and wellbeing. On a more formal note: I completed my BSc (Genetics, Psychology & Physiology), a BSc Honours (Human Physiology) and Personal Fitness Trainer (IIFT). I’m currently busy with my Masters degree (MSc) in Sport Physiology. I’m a highly qualified fitness specialist and business manager as well as co-owner of Ariani Health Solutions. I’m the owner of PlayFunFitness and co-owner of necessities (a multivitamin, -mineral and herbal supplement for teenagers and young adults). "As someone that has been treated for various stress related illnesses by many health practitioners, the books at the counter of my local health centre immediately appealed to me. ‘Stress Solutions’, ‘Managing Diabetes & Related Health Challenges’ and ‘Health and Happiness’, written by medical doctor and author Dr Arien van der Merwe. I bought them and after reading through them for a while, I decided to consult with the author and we started working together on the ‘Optimise Your Health & Wellbeing in Only 12 Weeks’ Health Coaching Course. Dr Arien implemented the desired positive changes by mentoring and coaching me, providing gentle guidance, while facilitating the balancing of my mind, body and soul. These sessions assisted in removing limiting barriers and trapped emotions, while rewriting thought patterns, as well as integrating the left and the right brain allowing the two hemispheres to work together for effective whole brain functioning. Einstein’s dictum ‘ the whole is more than the sum of its parts’ really became a practical reality to me! Stress is created in the mind and we addressed it using various exercises as well as Dr Arien’s relaxation CD, transforming and shifting negative situations into positive ones. The sessions assisted me in reshaping my thinking, making better choices and opening up for better and new, opportunities and choices, as well as getting back my mental and emotional baseline - my body followed. Some examples of the exercises included were a daily journal and relaxation practice, a creativity box, a gratitude list and a list of what brings me joy as well as learning to set boundaries. We also considered and adjusted my eating habits and exercise program, and I was advised on using the correct natural food supplements and herbal remedies. 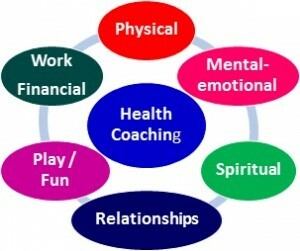 Health coaching or mentoring is the practice of health education and health promotion within a coaching context, to enhance the wellbeing of individuals and groups, by facilitating the achievement of health and wellbeing related goals. Health coaching or mentoring has become a very effective tool to help improve performance and productivity, manage stress and optimise wellbeing, achieve work related, as well as personal health and wellbeing goals, while being on the ever human quest for meaning and purpose in life. Coaching is about unlocking everyone’s own inner healing potential, to maximise their own performance, while helping them to learn (rather than being taught). It is the art of facilitation and ongoing support to improve performance, as well as the development of skills through a form of tutoring, mentoring or instruction. The aim of health coaching or mentoring, is to enhance wellbeing and full potential development in personal and work life. Health coaching or mentoring is a fluid and adaptable process, continuously adjusted to the patient’s needs and progress, which is both goal and solution focused.